Groundswell is excited to announce our newest team member, Isaiah Baldissera, who will be leading the Build segment of the Social Venture Program. Isaiah is joining us from a background in technology, education and meaning seeking in his own career and in helping others find their career path. He's got a heart of gold and an impressive skill set that is helping Groundswell be better than ever at what we do, and we are delighted to have him join our community! 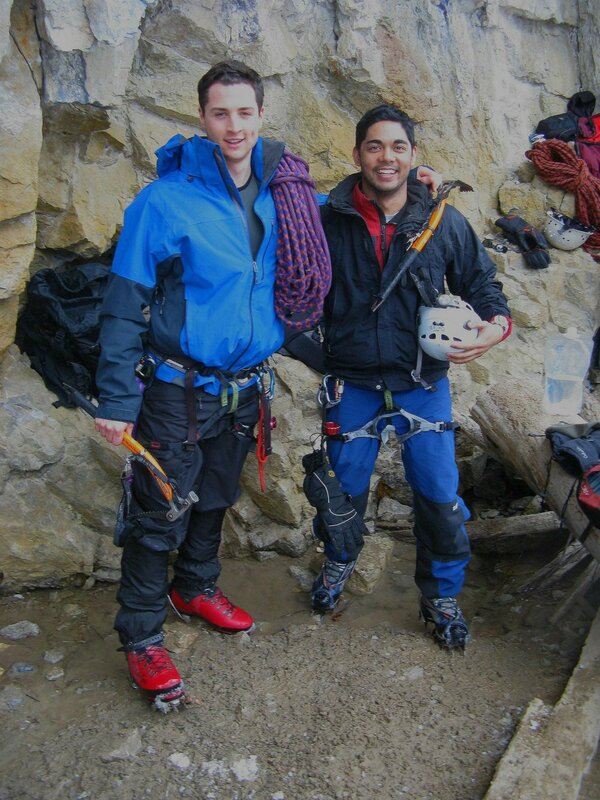 Isaiah (on the left) and a friend on an ice climb. I grew up in Vancouver and when I graduated from university with a business degree, I had all of the opportunities that I'd dreamed of. It wasn’t long after I started interviewing with firms that I realized that something was missing. I remember the distinct feeling of being in a boardroom for an important interview, and glancing out the window at the city below while thinking “Is this really all I’m meant to be doing?”. I spent the next year travelling, studying abroad, and reflecting on what I wanted to do with my time on this planet. Upon returning, I had to rethink my future and dig deeply into understanding how I could align my work with my values. Eventually I ran into two people I’d graduated from business school with. They were working on an idea to increase student engagement for marginalized youth. We set out to define what engagement actually was, and found that people of all ages who were clear on their interests, strengths, and values were far more likely to be engaged in whatever they were doing. These people were able to see how each activity was aligned (or misaligned) with where they wanted to be heading in life. We started creating online tools and resources which have evolved into what we have now – the enScholar learning tools and the TryIt experience-finder. We’ve had users from over 40 countries, partnered with organizations like NASA, FutureLearn, and the YMCA, and have run workshops for high schools across North America. 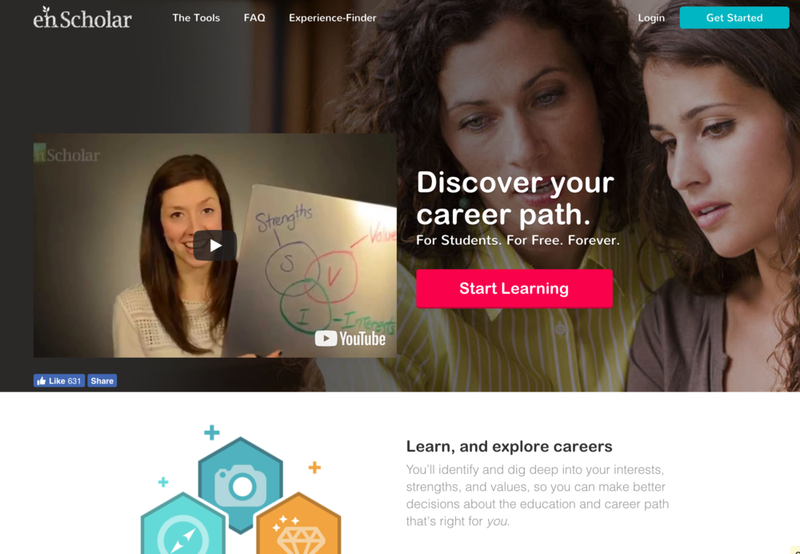 enScholar - a learning platform helping high school students explore career paths. I don’t have a magic formula to find the ‘perfect career’. However, my team and I have learned that, more than a platform, algorithm, or tool, it’s the right mindset that helps career seekers and aspiring entrepreneurs alike to build the future they’re looking for. I’ve written about what career-seekers can learn from entrepreneurs, using Eric Reis’ Lean Startup principles as a framework, if you’re curious. Since building enScholar and TryIt, I’ve focused my attention on other forms of education technology, design, and the future of work. Another concept that’s been on my mind as of late is how we can build great communities, either in-person, or digitally. My desire is to foster connections between dynamic individuals and facilitate the discussion of meaningful ideas which will lead to the creation of new projects aligned with social goals. With technical automation and Artificial Intelligence permeating both our economy and our daily lives, one of the greatest problems we will face will not only be finding jobs, but finding work which is intrinsically motivating and fulfilling. I believe entrepreneurship (and, my hope is social entrepreneurship) will play a huge role in the new world of work. This is why I’m excited to join Groundswell, an organization dedicated to providing accessible education to create meaningful employment and social ventures. As an inclusive community of ‘everyday people’ from various backgrounds and experiences, I believe Groundswell is more than simply a startup incubator, it’s a team united by a drive to have a positive impact on the world through our work.